Sewing, Quilters Crocheting, Knitting! Help Make a Positive Difference for Hospice Patients! Do you have skills in crocheting, sewing, quilting or knitting? Would you like to make a difference for hospice patients? 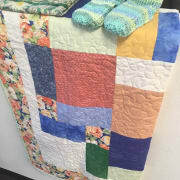 Hospice of the South Coast is seeking volunteers to make lap blankets, blankets, quilts, pillow cases, scarves, shawls, hats, socks, slippers for our patients in need of warmth and comfort. Often times our patients, especially ones in facilities, are in need of cozy items to make them feel more at home and comfortable. These cozy items brighten up the patient's rooms and lives. They also add a personal touch in a cold medical environment. If you're interested in this opportunity, please contact Cindy Gilcrest at cmunson@hospiceofsouthcoast.com or at 760-519-1339. 2 hours per week, but we're flexible!